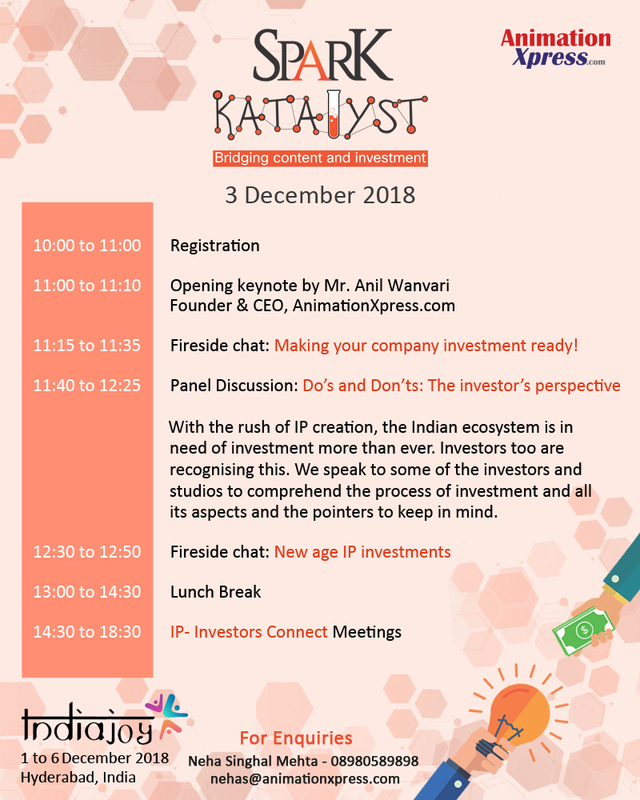 India’s leading animation, gaming, VFX and comics destination AnimationXpress dot com has launched a platform-SPARK KATALYST, to bridge the gap between investors and IP creators. The platform will be targeting animation studios who have created great IPs and are looking for partners/investors to see their idea develop into finished animation series/films. The platform aims to bridge the gap between investors and IP creators. The content-rich ecosystem is in need for investment more than ever with the homegrown IP rush and hence, the platform will act as an investment accelerator, giving further impetus to the industry’s growth. The investment platform is being put together as a part of a great initiative being organised by the Telangana government and TVAGA in early December 2018 called IndiaJoy 2018. The team will be putting in their expertise that they’ve garnered over the past decade of being a part of the AVGC industry as a platform. A select group of blue-chip investors will listen to you as you share your IP ideas/projects with pre-fixed and pre-decided meetings. The goal at AnimationXpress is to assist in the creation of several global IPs from India by working as a catalyst. And if you believe your IP is investment worthy, your studio might well get catapulted to the top echelons of the animation ecosystem, should you get a buy-in from the investors at AnimationXprerss’ SPARK KATALYST. Venue: Novotel Hyderabad Convention Centre,Hyderabad- India.